1 Arranging for the transport of the korowai a) from Rawhiti per Kia Maia b) from Paihia per your friend at Fullers ensuring that it got put on the right bus from North c) collecting korowai from the Depot d) — ensuring that the korowai was secure around my shoulders as it kept on slipping off because it was too big and loose and you had to keep hitching it up e) driving us to Govt House because you knew all the shortcuts while Rahema was in the back seat keeping in touch with Nanny Helen who had already arrived at Government House and advised us where to park. Sue and Tuki were behind us in their car. Lovely to meet up with Helen and Elizabeth my other total supporters for my cause! That morning, Rahema had asked me to hear her karanga – we had a couple of runs-through and she was excellent. We arrived at Government House and were met by Helen and Elizabeth. We were all ‘done’ in lots where we were separated from our whanau although I had asked Helen to stay beside me, which she did. We were then briefed through the procedure –everything was clock-work which was to be expected – not like us, stand upto mihi when one wants to!! 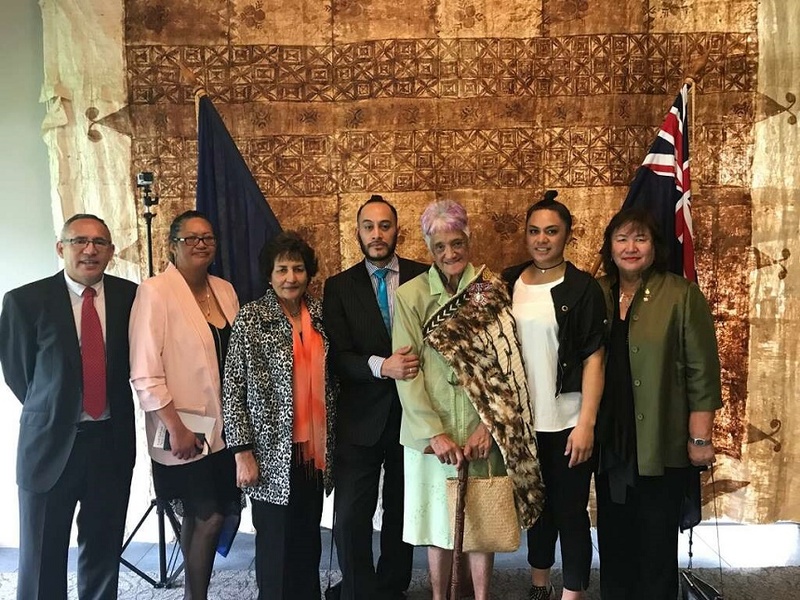 Because we were separated from Rahema and Tamaira, it went through my mind that I would do the karanga myself – “Tena koe e te Rangatira i roto i te kaupapa o te ra nei ee. 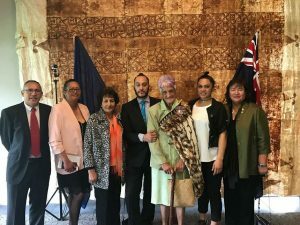 “ It came to my turn to stand up as the official read out my credentials, and as I went to step out from my seat, I heard Rahema, who had been standing at the back, start her karanga to me – oh, people, it was so awesome, I went all “prickly” with pride… and when she finished, Tamaira let forth with his haka……… that really topped off the whole Investiture ceremony for me. To me, I felt the presence of my own Mother and Father, my sister Iti (Sue’s mother) Sue’s father Mick, my own brother Mita and of course Nanny an Gramps, (Anya’s parents) – Walter & Jean, and not forgetting our most recently ‘gone’ mokopuna Teina. I was also thinking of my brother Paddy (Waihuka) in Green Bay Wisconsin. So very honoured to have Helen and Elizabeth there with me. Another recipient of an award yesterday was a woman whose whanau lived along Mead St, where Ipu and I had our home for over 50 years, and her name is Annie Crummer. It was lovely to make that reconnection. One of the clauses in my citation was the fact that I could scribe (shorthand) in both Maori and English which I didn’t think was a big deal, but the Governor General mentioned that fact when I stood in front of her. Also a couple of men mentioned that to me too afterwards and asked how did I manage that. Well I answered that the outlines in English vocab are the same in Maori – for example – man, rang, fan – with the “a” sounding words, the shorthand outlines are above the line Now with words like men, pen, ten where the vowels are different sounding, the shorthand outlines are on the line. (Actually, I don’t know where I’m going with this!! so I better just shut up!